The Great Smartwatch Experiment – Sanspoint. Regular readers will know my strong skepticism about wearables. For those who are unaware, here are just a few examples. I remain a skeptic, despite being in the target market for these devices, especially smartwatches. I’m one of the few in my generation of late 20-/early 30-somethings who wears a watch regularly: typically a cheap Casio F91-W, switching to a quartz analog Swiss Army watch on dressier occasions. I should be all over wearable tech, but everything I’ve seen—including the upcoming Apple Watch—has left me cold. Actually, I’m more lukewarm on Apple Watch, but I can’t afford one. What I can afford is the most basic, $99 Pebble smartwatch. After spending some time thinking about my skepticism on wearables, especially having never tried one, I thought I should see if my stance is justified. It’s possible that only by using a smartwatch can I find a place for it in my life. So, on my lunch break this past Friday, I walked to the Best Buy near my workplace, and walked out with a Black, base model Pebble. I didn’t go in blind. I’ve read Stephen Hackett’s thoughts on the Pebble, and while he ultimately decided that “It’s not that wrist notifications aren’t useful… the device itself just isn’t for me.” That’s a risk I’m taking with the Pebble as well. I might discover that it’s right for me functionally, but the product itself isn’t. In just a couple of days of use, I’ve already run into annoying issues that are related to using the Pebble with iOS. They’re not deal breakers, at least not yet. 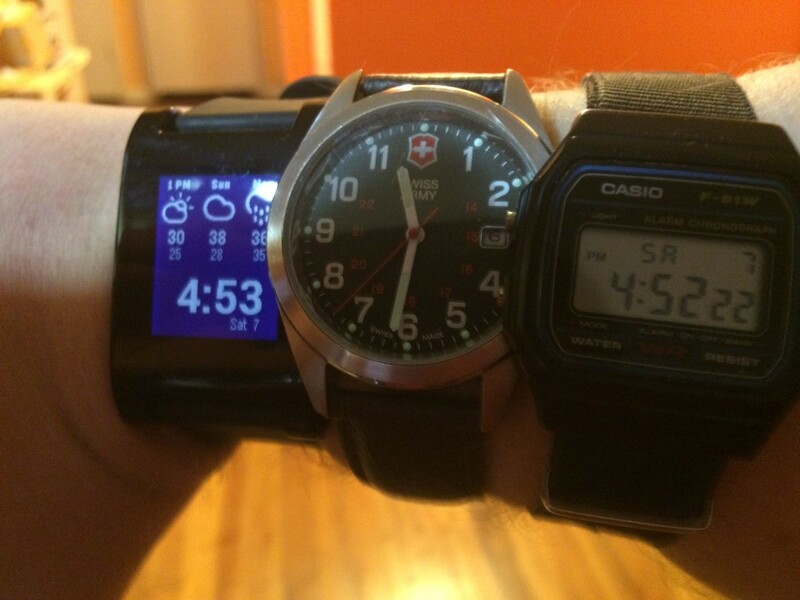 Right now, I’m just adapting to having a smartwatch. I’ve already had to turn off some (more) notifications, and adjust how my phone handles notifications in the interim. When I first set up the Pebble, I had vibration alerts on my phone, and I would feel it buzz in my pocket before the Pebble buzzed on my wrist. I also was surprised at the strength of the Pebble’s vibrating motor—if the Apple Watch promises to be a “gentle tap on the wrist,” the Pebble is more “involuntary muscle spasm.” Cursory Googling and checking /r/pebble suggests that the vibration strength is partially a function of novelty and the silicon strap. 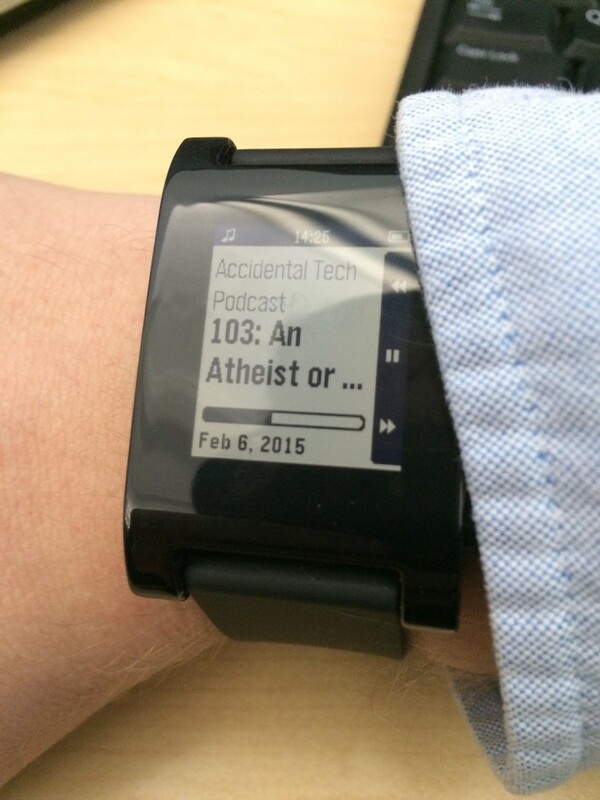 I have more first impressions of the Pebble as a device, and I’ll share those in a separate piece. As for whether having a smartwatch will change my opinion on their utility? That remains to be seen. There have been moments, even in the first days of use, that reveal the potential of the form factor. I’ve also had moments that reflect the exact frustrations that have worried me and informed my general skepticism of wearables. I’m not making any judgments yet. When I do, I’ll share them here.